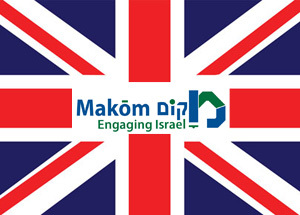 Makom has been invited to run a track at the We Believe in Israel conference that will take place in London on May 15th. Two strangers – one Israeli, the other English – meeting over Israel and texts. Together they will explore their favourite texts about Israel and the Jewish People. How did Jews, Christians, and Muslims imagine Jerusalem as the ultimate gateway to heaven? And how did the ways they saw Jerusalem also reflect the ways that they saw each other? Surprisingly enough, there are three values that sum up Israel, that we all agree on irrespective of politics! Exploring “A Free People in Our Land” in the light of religious pluralism, refugees, and Haiti. How does the “Jewish and the Democratic” fit together in a workable fashion? Looking together at the theory and the practice of the Jewish State. Did Zionism deliberately ignore the Arab presence in Palestine/Eretz Yisrael? Herzl, Buber, Jabotinsky, and Ben Gurion will help us look at the formative trends within Zionism that continue to impact the present-day. It’s about the Culture, dummy! Israel may not yet be the safe haven of the Jewish People, and its light unto the nations is not always appreciated. But the vision of Israel as the home of Jewish cultural renaissance is being fulfilled in inspiring and creative ways. Experiencing cool music, films, literature, and cultural trends. A participatory study session around the “Spies episode”, when the question of truth and slander about the land of Israel is first raised. What does it mean to be a patriot? Can patriotism ever leave room for critique? Perhaps it is time for a paradigm of Critical Loyalty to come to the fore. A liberating experience for the critical supporter of Israel. Can Israel’s treatment of Ethiopian immigrants be dismissed as pure racism, or are there other agenda at play? So is it “Apartheid” and was it “Disproportional”? Exploring the challenging and powerful analysis of leading scholars Gideon Shimoni and others on Apartheid analogies, and Moshe Halbertal and Michael Walzer on Operation Cast Lead. After watching two specially-made films on their contributions, we will ask: Do we buy it? Is it useful? What are the moral connections between a People, a Place, and a State? Looking at the big thinkers of the Western world, and the Jewish world, to find our own answers. What challenges arise when your dream comes true? The Jews dreamed of the Land of Israel from afar for generations. It was only in modern times that the dream found real-life consummation. Our conversation will visit a variety of voices – old and new – struggling with the place of Israel in the Jewish story. An engaging exploration of Englishness and Israeliness through personal stories, song, and photography. MAKOM exclusive:Purim or Yom Ha’atzmaut?